Dirty Torque are throwing a Rolling Road day for us! 02/04/2016 -- Which is 2 weeks before the inaugural T17.Club meet at Big-Bang, Santa Pod. - Seeing your graph will help you know when best to change gears down the track. Spend the day chatting with the technical guys who will be there to give advice, as well as fellow T17'ers to pick each others brains on setup and experience. Bargain for £30 with a £10 deposit, paid to me for reserving your place. Limited availability for this guys. Get your name and deposit to me ASAP. Although they are well versed in the easier skill of turbo petrol tuning, Dirty Torque specialise in the trickier 'Dark Art' of Turbo Diesel Tuning. We are now taking deposits for this. £10 deposit vis paypal or bank transfer, then £20 on the day. --LIMITED PLACES-- So speak to me ASAP if you want in. Places have started filling up peeps! Get your name down quick! Hey Rochie.... for £30, why not have a run...? DirtyTorque setup my van (221bhp/389lbft) and also Mule's (230bhp/349lbft) they are a TOP quality outfit and really care about their customers. First kids are always late, you've got at least a week to play with! I won't know if I'm free for a good month or so. If I am, I'll try and pop in (if I've put it all back together by then), assuming all the spots are gone by then. 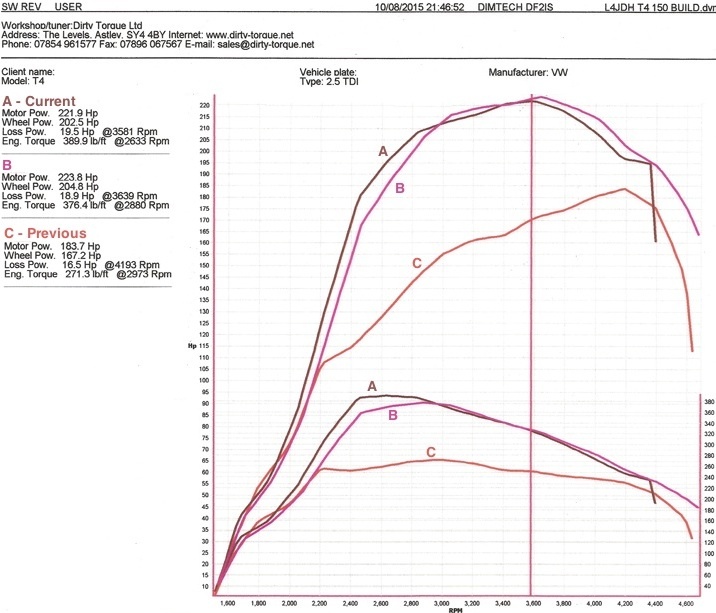 We are up to 10 names now guys... Who else would like to blow off the cobwebs on their T4... getting some advice and a print of of your torque curve.